The second College Football Playoff ranking is out and the top three spots (#1 Mississippi State, #2 Florida State, #3 Auburn) are unchanged. The big news is that Oregon moves up to the all-important No. 4 spot, replacing Ole Miss. Meanwhile, Alabama is No. 5, the first team on the outside looking in. In all likelihood, these won’t actually be the four teams that make the playoff. Teams still have three or four games remaining, as well as conference championship games in some cases. We also still have no idea how the committee is going to weigh conference championships or whether a Big 12 champion is going to be penalised for not having to win a championship game. But that doesn’t mean these weekly meetings of the committee aren’t important. In fact, they are genius and it could change how things are done in other sports. Instead of a system like college basketball where a committee is locked in a room once for a few days at the end of the season, the playoff committee members are forced to discuss teams every week for more than a month. This forces the committee to re-evaluate entire resumes for each team every week. Instead of assuming the rankings were right the week before and just making adjustments based on the most recent results, as typically happens in traditional polls, entire schedules are scrutinized and rescrutinized. In other words, instead of hoping to get it right in one shot at the end of the season, the committee is slowly getting smarter and building towards something better. 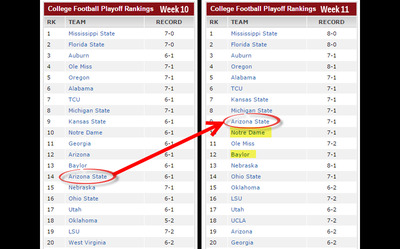 The perfect example is Arizona State. The Sun Devils, No. 14 last week, moved all the way up to No. 9, leap-frogging two other one-loss teams that won this weekend, Notre Dame and Baylor. That is a bigger jump than you would expect based on beating a lower-ranked team (no. 17 Utah) at home in overtime. 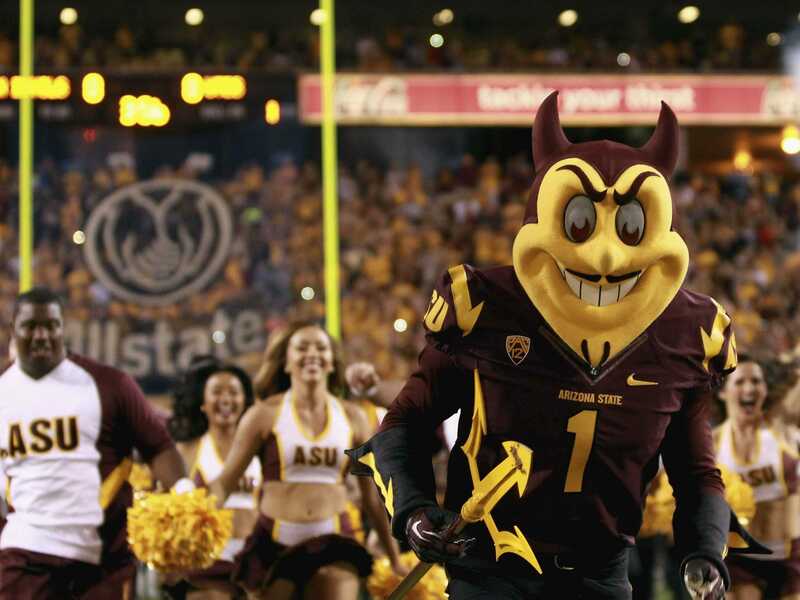 The Sun Devils are suddenly playoff contenders. The committee clearly noticed that Arizona State not only beat Utah, but now has four straight wins, including three against teams that were ranked at the time, something Notre Dame and Baylor can’t say. The “evil” part of this is that unlike traditional polls, teams can get leap-frogged from week-to-week without losing. Fans of No. 6 TCU, for example, feel like they only need two teams above them to lose in order to get into the playoff, but there’s a real possibility that a team ranked below them this week could jump above them next week. The football playoff is not perfect — it would still be better with eight teams instead of four — and in the end, the only ranking that really matters is the one at the end of the regular season. But even though the rankings in Week 11 don’t mean much, the meetings behind the rankings are making the committee smarter and the inevitable mistakes and oversights early in the process will hopefully be weeded out by the time the regular season is over.